High Barn is an outstanding barn conversion using large beams from 18th century ships. A second barn is used as a large games room with table tennis. Situated in a Designated Area of Outstanding Natural Beauty in South Devon, it is just one mile from the spectacularly beautiful and unspoilt Erme estuary. Wonwell beach on the estuary offers vast expanses of sand and is perfect for swimming, paddling and fishing nets at low tide and windsurfing at high tide. Nearby there are more beaches and coves as well as fine cliff top walks. The National Trust path runs along the coast line and crosses the estuary, a Site of Special Scientific Interest with fascinating birdlife. High Barn sleeps up to 8 adults/children and is privately owned. During the summer it is let on a weekly basis, Friday to Friday. In winter, it is available either for a full week, or for a weekend. Master bedroom has an ensuite bathroom. We spent a week in this lovely barn with our 3 adult sons, our 12 year old daughter and our dog.This is a lovely house and in a perfect position for exploring the coast and having Wonwell Beach just a walk away was fantastic. We loved walking and exploring the south coastal path and we really enjoyed being able to walk to the Dolphin Inn pub. The games room is a real bonus and meant that everyone had space. We would all really love to come back. Thank you. We had a lovely time at High Barn. The house was very comfortable, quiet and relaxing and has real character. The Erme Estuary (previously unknown to us) is a hidden gem - we enjoyed some splendid walks along the coastal path in both directions an also a few delightful, if bracing, early morning swims at high tide. Thank you. Very glad you enjoyed yourselves. We had the best holiday ,helped by the weather, and the great beach which was excellent for family football ,cricket ,swimming and rock pools . We had A family table tennis tournament in the games room and BBQs in the garden . We had a wonderful weekend staying at High Barn it had everything we needed for a family of 8 and a dog from 2 years up to 80 years, loved the garden, there was plenty of space to accommodate us all. The games room kept the grandchildren busy with the ping pong, and their own space. The adults relaxed in the lounge and garden, the neighbour was very nice and friendly and the locals when you met them walking about. A good standard and would recommend High Barn for family holiday. High Barn is a beautifully converted stone barn, comfortably appointed and with all the right traditional country atmosphere. The play barn is a very useful annex, and whilst the property has no view, the immediate location is pleasant, with lovely and peaceful surroundings. The nearby beach and villages are absolutely stunning. Fantastic autumn break. 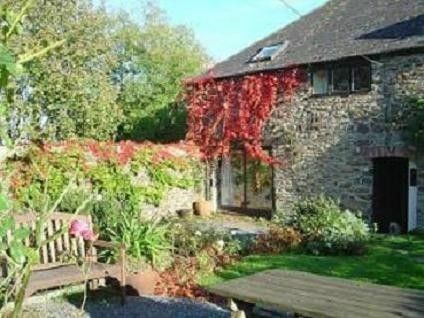 We wish we had discovered High Barn years ago as we know the area well and this is a lovely place to stay. Spacious and comfortable, everything you need provided and lovely and warm with the Aga on. We were very fortunate with the weather and had warm autumn sunshine every day so could take advantage of the 'sun trap' garden. The play barn with table tennis is a good bonus particularly if the weather is bad. Tim and Sally answered e-mails quickly and made sure everything was OK for us. Some lovely walks around the Erme Estuary when the tide is out. Would thoroughly recommend High Barn. The Beach - vast and excellent for swimming, paddling, boating, sand-castles. Walking - very near the coastal path, spectacular walks in both directions. Tennis - visitors welcome at Devon Tennis Centre, Ivybridge. Leisure Centre, with indoor swimming pool, at Ivybridge. Weekly rental is from Friday at 3.00pm to following Friday at 10am. Weekend or weekday breaks - at reduced rates - are often possible off-season. Prices include the supply of bed-linen. Take £50 off the weekly price if you prefer to bring your own bed-linen. One pet is welcome by prior arrangement at a charge of £20 per week or shorter.